To be honest I haven’t been much of a coffee lover for most of my life, certainly not the black coffee people have by the mug fulls in the US. Most of that stuff, bought at chain stores, tastes like cardboard anyway. I have though always enjoyed coffee made with milk and sugar, usually using instant coffee. 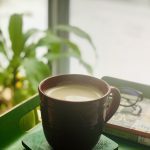 Cold coffee with lots of ice and sometimes a scoop of ice cream was a staple treat in the summers – the only caffeinated drink allowed for my brother and I until we were both in high school and permitted to have chai. Of these homemade milky coffees the hot, frothy one is the beaten coffee. Its not literally beaten, but stirred vigorously with sugar and a few drops of water or milk. At the end one is left with a thick mix that doesn’t drop off a spoon. Added to warm milk it creates a creamy, frothy layer on top resembling a cappuccino. Here I do mean REVERSE ENGINEERING in its most literal form; from when the coffee is added to what creates the froth. Cappuccinos are made with espresso shots that are topped with approximately equal volumes of frothed milk. When you first sip a cappuccino there is a slight demarcation between coffee and milk; as you stir in sugar (or not) and as the froth collapses it becomes a milky coffee. Beaten coffee on the other hand relies on the actual mix of coffee and sugar to create the froth. As the two are mixed air gets trapped and is released when mixed with milk. The consistency of a good beaten coffee mix is similar to a stiff buttercream – thick, glossy and clingy. Froth can and is often created by continually transferring milk between two containers from a great height, held as far apart and as high as humanly possible. 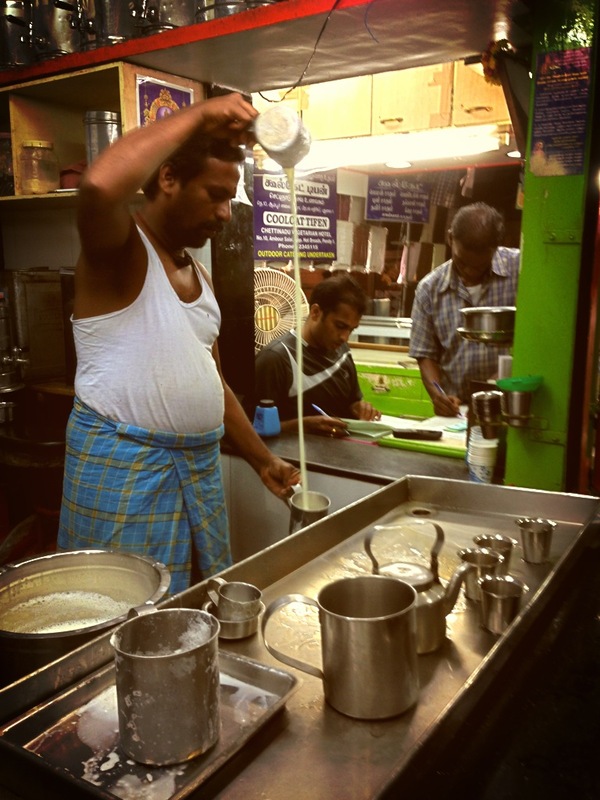 This is a common sight at roadside coffee and tea stalls in India. 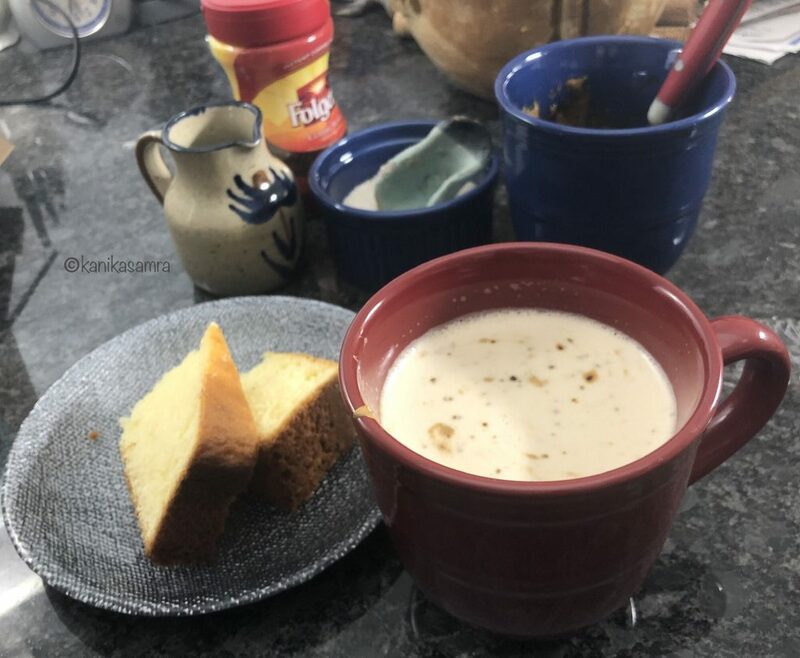 Airing milk or a hot beverage (prepared tea or coffee) achieves two goals – creating a froth and reducing the temperature to drink it right away. Who says only cappuccinos are frothy?! Read on to replicate the froth without testing your stamina, balancing abilities and heat tolerance. You’ll need a mug or a cup and spoon. Take a coffee mug or a cup (not a small tea cup) and add coffee and sugar to it. Mix with a spoon. I like to use a teaspoon with a rounded handle to beat coffee. It has a good grip that doesn’t slip. Ingredients – sugar, instant coffee and the beaten coffee mix. Next, add 1/2 tsp water and start stirring. Do this consistently for the next 5 minutes or until you see sugar dissolving. 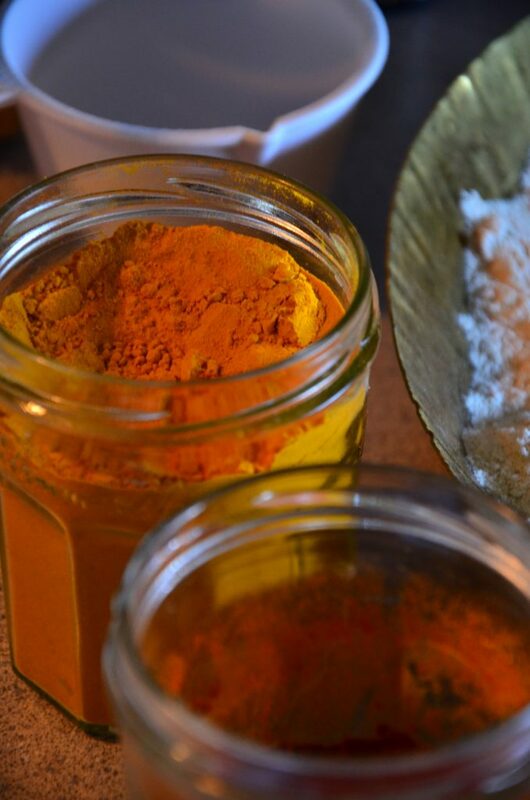 If the mix is too thick and difficult to stir, add a few drops of water, not more than 1/2 a teaspoon. Continue stirring, it will feel like you are trying to move setting cement. Keep at it! The result will be worth the effort. At the end of 10 minutes of stirring and almost wishing you hadn’t begun (but it will be so worth it!) you should see a thick glossy mix like the one above. It should be thick enough not to fall off a spoon when scooped up. To finally drink the coffee heat up milk. I do this the easy way in the microwave; 1 minute at full power for each cup of a milk. For my cup of coffee I add 3/4 cup milk plus 1/4 cup water. Often at home we make a mix that is half – half. Do as your heart pleases, including using only milk. Put a teaspoon of the beaten coffee mix in a mug and then pour milk over it. Mix well. Add sugar as needed. 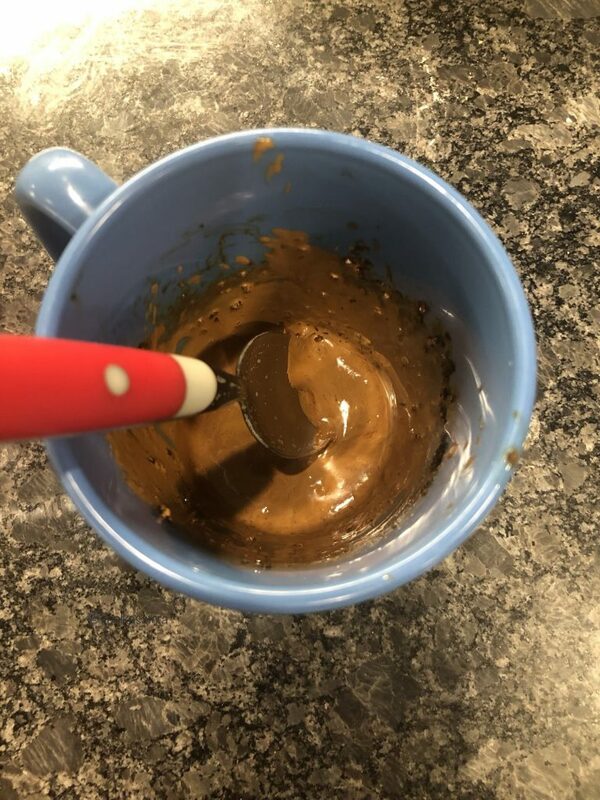 Sometimes the mix is so thick that you’ll have to leave the spoon in the cup. Works just as well – everyone can stir their own coffee. The good thing about making beaten coffee is that it can be a social event both, at work or at home, where everyone keen on drinking takes turns, pouring in their love (for coffee, of course!) and elbow grease to get the task done. If that isn’t an example of waking up the body and mind with one task, then what is? 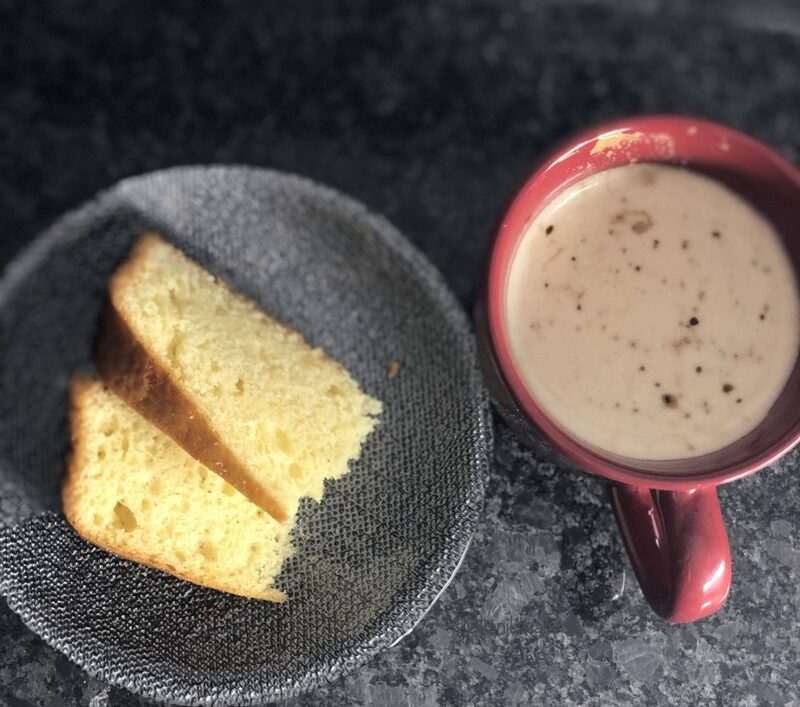 This beaten coffee recipe is the perfect way to indulge in cappuccino like frothiness without the fuss of a coffee machine. Try this easy trick from Indian homes. 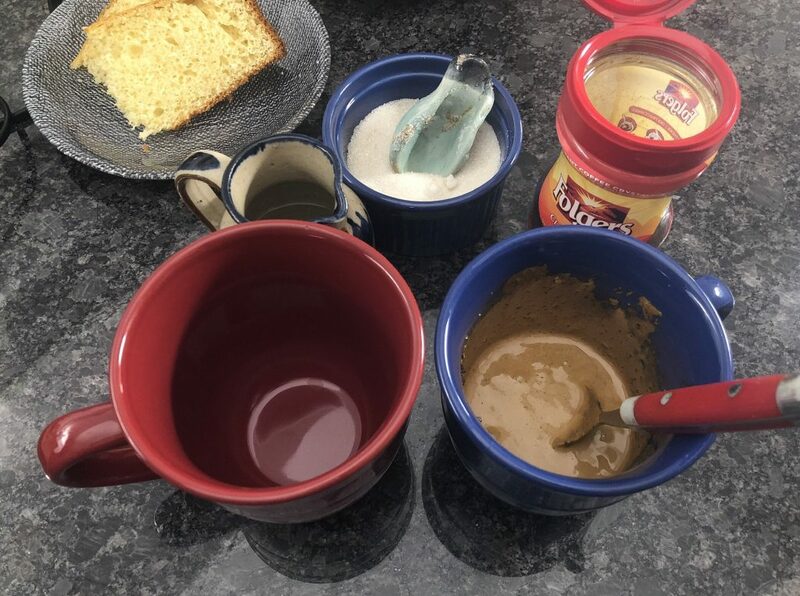 Take a coffee mug or a cup and add coffee and sugar to it, mix with a spoon. Next, add 1/2 tsp water and start stirring. Do this consistently for the next 5 minutes or until you see sugar dissolving. If the mix is too thick and difficult to stir, add a few drops of water, not more than 1/2 a teaspoon and continue stirring. At the end of 10 minutes of stirring you should see a thick glossy mix, thick enough not to fall off a spoon when scooped up. To finally drink the coffee heat up milk. For my cup of coffee I add 3/4 cup milk plus 1/4 cup water. Put a teaspoon of the beaten coffee mix in a mug and then pour milk over it, mix well.